Last Sunday, Caplin attended the Silicon Milkroundabout in the Old Truman Brewery, near Brick Lane. Mike, John, Pat and Jana presented Caplin’s technology and spoke with a lot of IT professionals about the exciting opportunities available at Caplin. 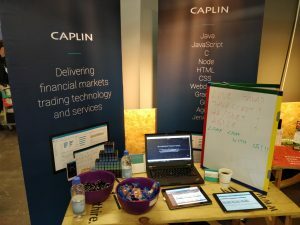 For a list of the current roles we’re recruiting for, see Caplin’s recruitment profile on the Silicon Milkroundabout site. It was a great event, but if we missed you (or you missed us), then get in touch directly (recruitment@caplin.com), or we’ll see you there next time!